The stock market surged on Monday—and it really needed to. U.S. stocks are coming off the biggest weekly decline in more than two years, and the aftermath of that drop has market technicians warning that major indexes are on the verge of a full-fledged, technical breakdown. “The extent of the deterioration in equities is very much a concern given the combination of near-term technical damage, along with the decline in longer-term momentum after having reached record overbought conditions into late January,” wrote Mark Newton, technical analyst at Newton Advisors, in a Monday research note. The S&P 500 index SPX, +2.72% ended Friday’s session clinging perilously above its 200-day moving average, which was at 2,585.22. The broad-market benchmark, ultimately, ended at 2,585.38—an encouraging sign for market bulls. Market watchers tend to follow moving averages to help determine if bullish or bearish trends are intact. A Dow Theory sell signal was close to forming. According to MarketWatch columnist Mark Hulbert there are a number of steps, but as of Friday, the market had just to see the Dow Jones Transportation Average DJT, +2.07% close below its Feb. 9 low of 10,136.61 to trigger that sell signal after the Dow Jones Industrial Average DJIA, +2.84% on Friday closed below its February low. On Monday, the transports closed up 2.1% at 10,373.21. According to data from Michael O’Rourke, chief market strategist at Jones Trading, a little more than half of Dow components were trading below their 200-day moving averages, which hadn’t happened since 2015. 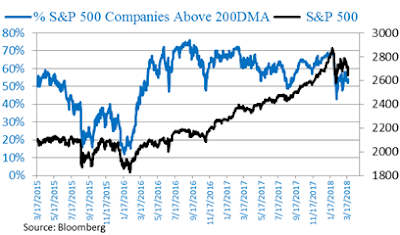 Meanwhile, about 50% of the S&P 500 components were trading above their 200-day moving averages (see second chart), with a break below indicating “notable technical damage has been done to this market,” O’Rourke wrote. Meanwhile, Frank Cappelleri, chief market technician at Instinet LLC, said it was important to watch for levels in the 10-year Treasury note, which had been seeing muted action even as stocks soared. That is especially curious given that bonds, considered havens, tend to see selling as stocks climb. Bond prices and yields move in the opposite direction. “If investors are more willing to buy bonds than stocks that would be telling,” Cappelleri told MarketWatch. The 10-year note yield TMUBMUSD10Y, +1.37% was recently at 2.84% compared with an intraday low around 2.82%. Monday’s rally came amid reports that the U.S. and China are conducting behind-the-scenes talks to avert a global trade war, with protectionist policies helping to prompt last-week’s initial wave of selling.